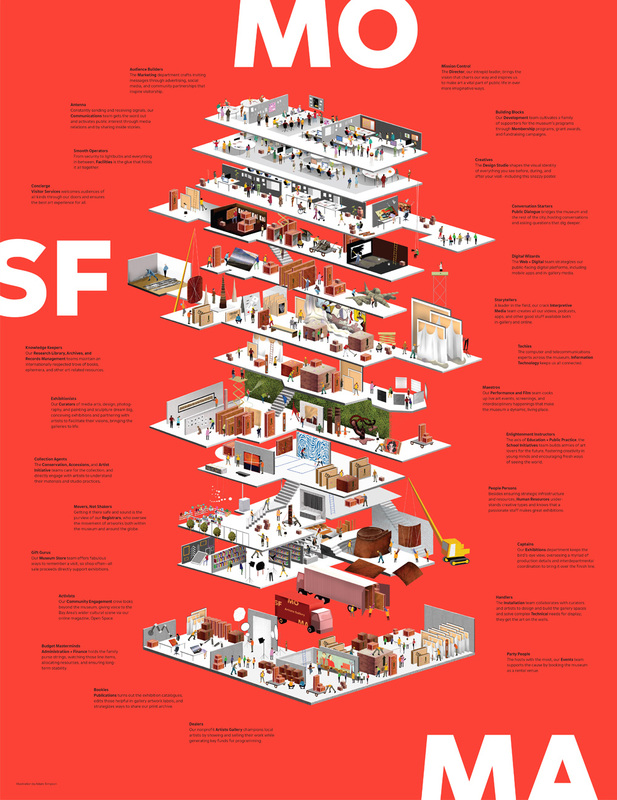 Established in 1935, the San Francisco Museum of Modern Art (SFMOMA) was the first museum on the West Coast dedicated to modern and contemporary art and has accrued a collection that includes over 29,000 works of painting, sculpture, photography, architecture, design, and media arts. The museum closed in 2013 to launch an expansion that maintains the iconic building of Swiss architect Mario Botta and integrates it with a new one designed by Oslo-based Snøhetta that will add 235,000 square feet to the museum. Last week, at a press conference, the museum launched its new website, announced its re-opening day as May 14, 2016, and introduced a new identity designed in-house. Just as our new building is much more open to the city, the new logo is deliberately porous, providing multiple points of access. 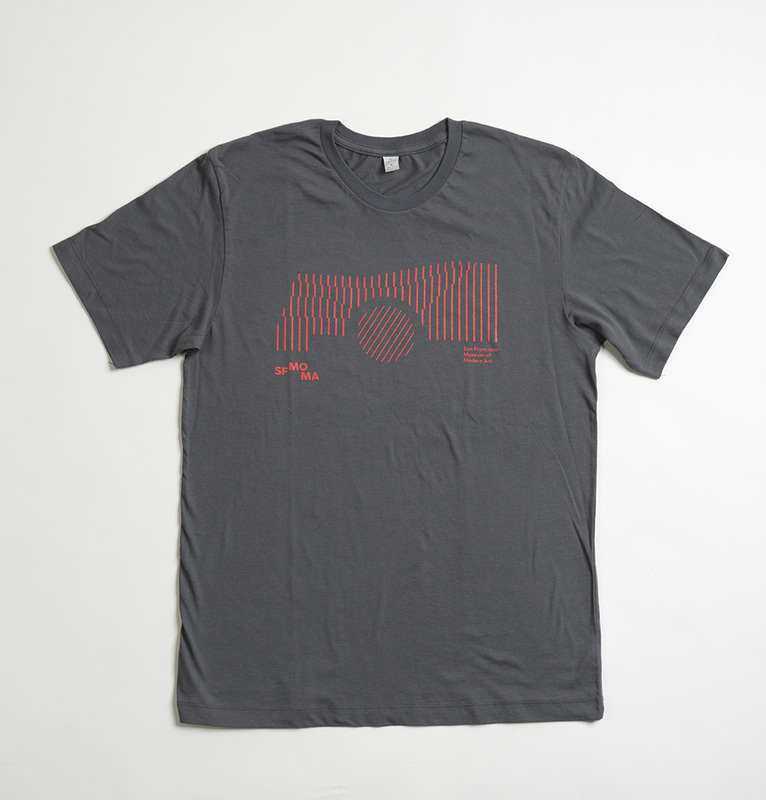 The organic configuration of the three parts echoes the idiosyncratic, free-thinking culture of the Bay Area, which is known for its nonconformity and diversity. The letters oscillate between a contracted and an expanded version. The two states actively respond to different formats and content, allowing the identity to become a conceptual lens through which the program of the museum is experienced. In short, the logo is designed to be as versatile and dynamic as the program of the institution. Logo detail in its “contracted” form. Contracted logo with full name. “Expanded” logo with full name. The old logo has been around for so long — 1995! 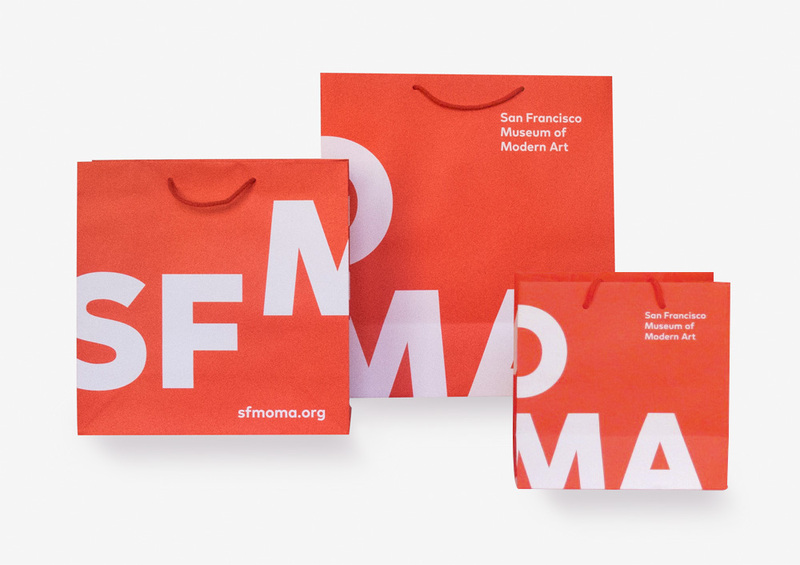 — that I literally don’t know any better option for SFMOMA, that’s the logo I’ve been seeing since I started caring about design. Which doesn’t make it a good or bad logo, it just makes it familiar. It’s a very constricted logo and it feels like it’s in a straightjacket, very much at odds with today’s friendly and airy logos. The new logo moves in that direction but without losing all its gravitas — it’s not set in lowercase and it doesn’t have rounded corners. At first sight, it seems like the logo is the same as old, sans box, and with a confused baseline. In its “contracted” form, yes, that might be it but even so, it immediately establishes a sense of tension and out-of-the-ordinary-ness that hints at something more interesting. The logo is at its best when it’s in the “expanded” version that pushes the three parts of the logo to the edges of any layout, exaggerating the tension and creating an abstract kind of frame that envelopes whatever is inside. You could read all kinds of bullshitty art metaphors into it but it’s just visually cool. 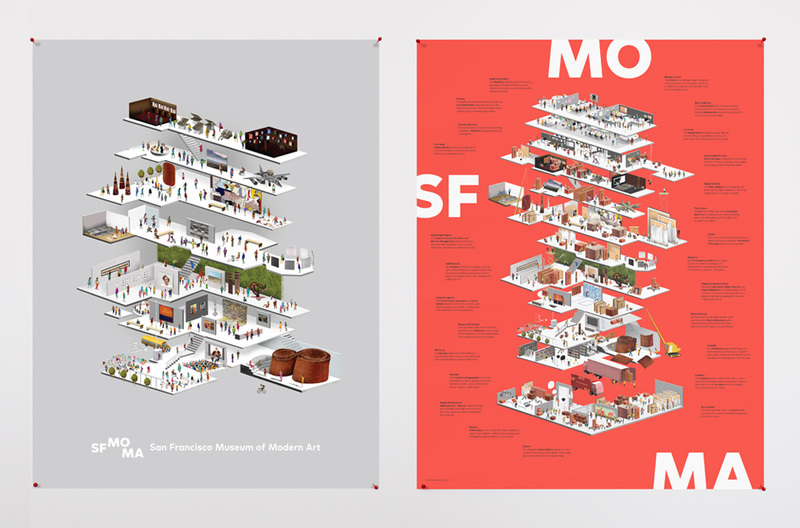 In either configuration the logo also enhances the readability of the name and breaks down all the elements that make the museum this museum: San Francisco, Museum of, Modern Art. We were eager to create our own distinctive typeface—one that would not only accomplish all of our functional goals but also work seamlessly with our new logo. We approached Christoph Koeberlin, a type designer at FontShop Inc., to design it. […] Our challenge to Koeberlin was to create a typeface, based on the letterforms present in our new logo, that was versatile enough to use in all of our applications, from running text to large-scale signage. [Hellip;] To accomplish our goals, two variations of one typeface were designed. [Koeberlin’s] FF Mark served as a starting point for both. 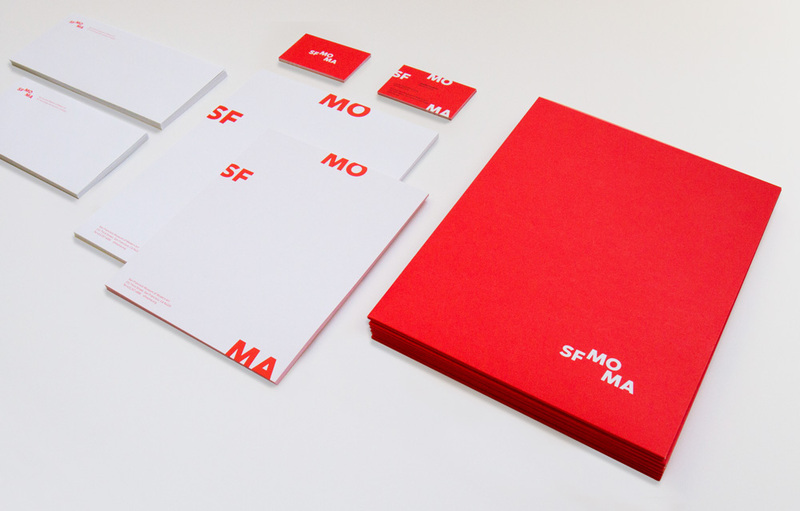 […] The letters in our logo served as the inspiration for SFMOMA Display, which adopts their open shapes and gracious curves. 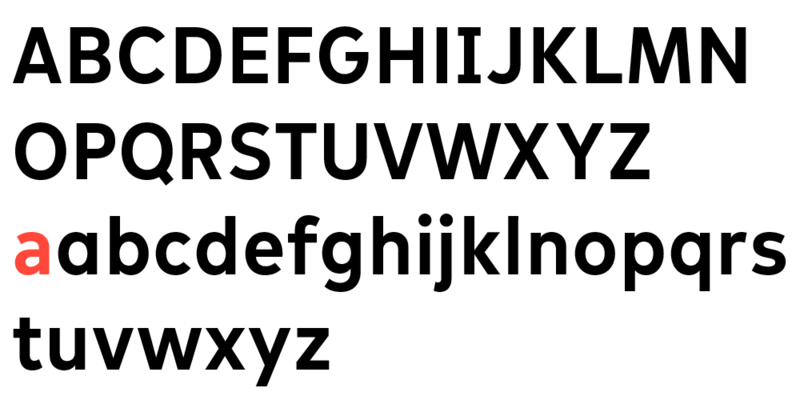 […] To create SFMOMA Text, Koeberlin increased the height of the lowercase letters (the x-height) in relation to that of the capital letters. By elongating the letters and eliminating their perfectly rounded circles, some of the pronounced distractions were removed. Custom display and text typefaces. 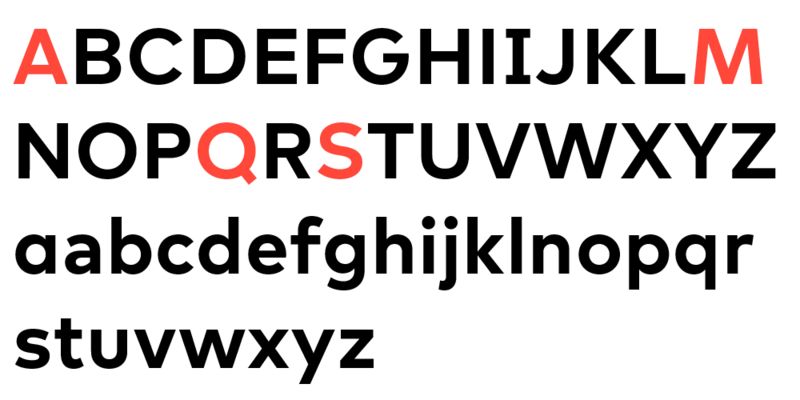 As I’ve mentioned in another post or two, I think we’ve reached a saturation point of new proprietary sans serifs. Type designers need to raise their fees so that it’s only done when it’s absolutely necessary. But, sure, this is a fine type family — it comes in a bunch more weights than shown here — and it meets some particular whims and demands. The primary color palette, consisting of warm red, white, and black, draws inspiration from the warm red tones of the Mario Botta brick and the cool white facade of the Snøhetta building. Warm red also happens to be one of the most visible colors through fog. As simple a device as it is, I simply love the expanded version of the logo and how it frames the different canvases. It’s literally edgy without being annoying about it. The logo also looks quite good in its contracted form and blown up in size. These stripes, along with the grid of red brick found on the exterior of the Botta building, contrast with the fluid, sinuous lines of the Snøhetta building. 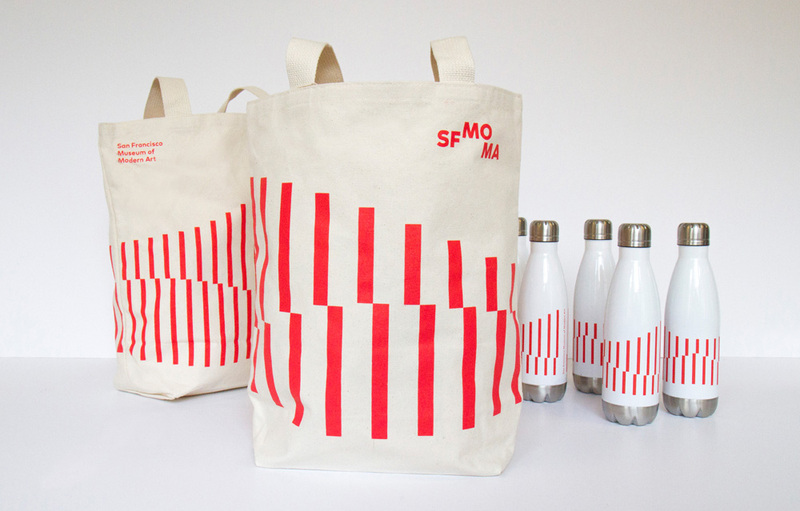 To celebrate the architectural joining of the two systems, we turned the horizontal stripes on their heads and introduced an undulating ripple, echoing the dance and contrast of line and form found throughout the two buildings to create a graphic pattern to compliment our new visual identity. New and old buildings’ patterns and textures. Pattern inspiration and logo animation. Poster for internal use. One side describes the public face of the museum and the other the behind-the-scenes (shown below). This side includes short descriptions of the different people, roles, and areas of responsibility. The addition of the striped patterns adds a touch of energy to some of the applications and gives the system some flexibility as well as a range of textures to apply in different configurations: from the minimal design of the bottles to the more ornate execution of the pencil sets. Overall, this is quite a nice update that matches the evolution of the architecture with a design that is vibrant and energetic.